"Energy. Balls. Rock n' Roll"
Described by Hot Press as "Energy, balls and pure rock n' roll" Scally writes and co produces all his own songs. Scally's songs have been credited for being rooted in working class ideologies - unemployment, teenage pregnancies, drink and substance abuse and crime, whilst also critiquing wider social issues such as homelessness and the refugee crisis. His backing band decorate these messages with intricate licks and flicks, groove filled grandeur for a true rock n' roll experience likened to Arctic Monkeys and Red Hot Chilli Peppers. Officially launching on April 6th, 2017 with the release of his first single 'The 7th Commandment' Scally has been labelled as a "definite one to watch" having "both balls and brains" and a swagger deemed "inspiring"(Stuart Clark, HOT PRESS) and has dates for a nationwide tour this summer throughout Ireland. 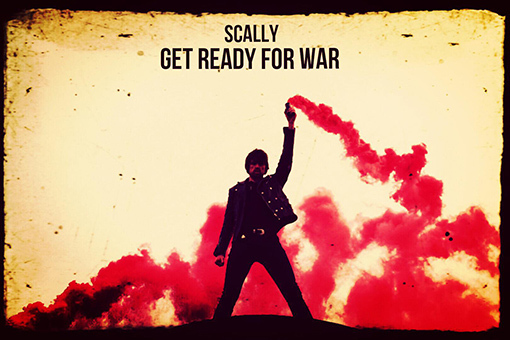 "With his challenging themes and vibrant energy, Scally brings a welcome dash of colour" (Will Faulkner, Midlands 103).